Rochester Quadrajet accelerator pumps have a plastic end which is often broken or damaged. Our kits have complete QJet accelerator pump assemblies including an ethanol-compatible Viton cup. Now you can replace that broken, damaged or incorrect pump with a new OEM-type replacement. Most Carter carbs had a triangular tag with the carburetor number. Older Carter BB carbs used on Chrysler products sometimes had an alphanumeric code (eg D7L2). Some carbs (especially AFB, Thermoquad and later YFA models) had a stamped number. The carburetor number always has the letter 'S' after the 3 or 4 digit number. Minor changes to the design are indicated by letters after the 'S' starting with 'A'. So, 245SA, 245SB, 245SC and 245SD are all the same basic carb number, with minor engineering changes. The letters don't affect which kit is used, so all 245 Carter carbs use the same kit (CK476, actually). Here's our visual Carter carb identification guide. 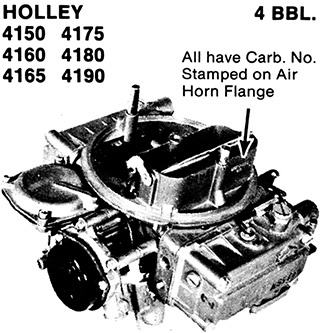 The list of all the classic Holley carburetor numbers from the 1930s to 1980s with applications and OEM numbers as well as kits, floats, chokes and manuals is here. American Zenith carburetors usually have a round, dime-size tag riveted to the top of the carburetor. There should be two concentric numbers: the outer number is the OEM number, which is the number assigned by the vehicle or machine manufacturer; the inner number is the Zenith number. Here's our numerical list of Zenith numbers and pictures of most Zenith carb types. Most production carburetors from 1934 onward have a code number stamped either on the body or on a metal tag attached to the body, which identifies the car or truck and yearly model on which it is intended. In the 1930's this number was often stamped on the throttle body. Later carburetors - 1940's and up - have the number stamped on the top of float bowl.